Like their cousins the rebbachisaurids, the dicraeosaurids have been on a roll over the past year. 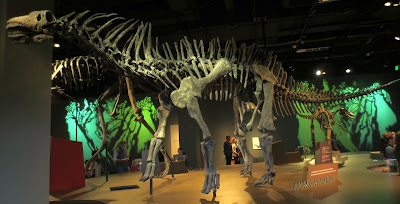 I featured the new oldest dicraeosaurid, Lingwulong shenqi, last year. This week saw the publication of another new dicraeosaurid, from a much more typical time and place (the Early Cretaceous of South America), but with a unique style all its own: Bajadasaurus pronuspinax. 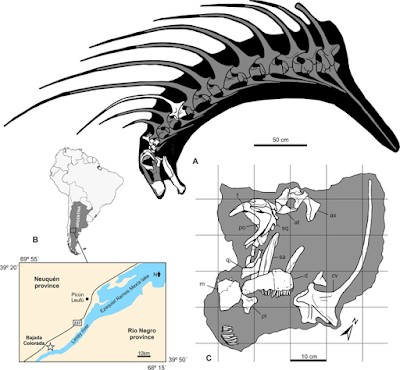 Genus and species: Bajadasaurus pronuspinax; "Bajada" comes from the Spanish for "downhill", but more properly is a reference to the locality, Bajada Colorada; "pronuspinax" comes from the Latin "pronus" ("bent over forward") and Greek "spinax" ("spine"), and refers to the outstanding feature of the animal, the long, anteriorly pointing neural spines of the cervical vertebrae (Gallina et al. 2019). Putting these together, we get something like "Bajada Colorada lizard with bent-forward spines". Citation: Gallina, P. A., S. Apesteguía, J. I. Canale, and A. Haluza. 2019. A new long-spined dinosaur from Patagonia sheds light on sauropod defense system. Scientific Reports 9: article 1392. doi:10.1038/s41598-018-37943-3. 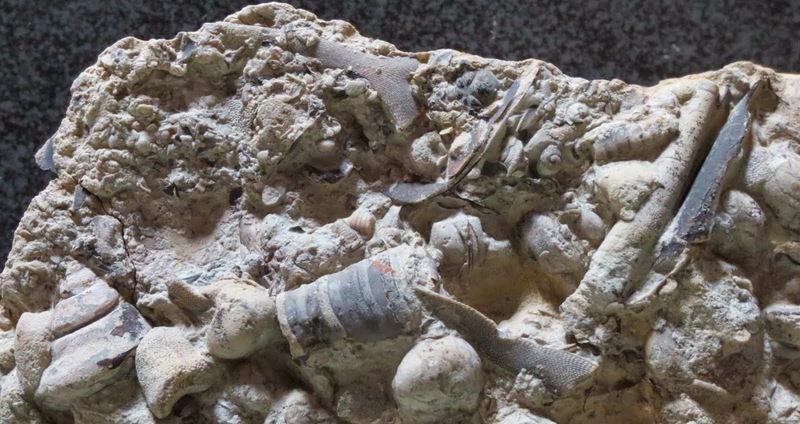 Stratigraphy and geography: The type and only known specimen comes from the Bajada Colorada locality off of National Route 237, 40 km (25 mi) southwest of Picún Leufú in Neuquén Province, Patagonia, Argentina. The formation is the Bajada Colorada Formation, of early Early Cretaceous (late Berriasian–Valanginian) age (Gallina et al. 2019). This formation is also notable for producing the latest named diplodocid, Leinkupal laticauda, which came from outcrops in the same area. Holotype: MMCh-Pv 75 (Museo Municipal Ernesto Bachmann, Villa el Chocón, Neuquén), which includes most of a skull (the front end and the back end plus the lower jaw), both proatlases (obscure little bones between the skull and the first cervical vertebra, the atlas), part of the atlas, the axis, and an anterior-middle cervical vertebra, perhaps #5 (Gallina et al. 2019). Sometimes a new dinosaur is not that impressive. Maybe there aren't a lot of bones, or the list of diagnostic characteristics is all impenetrable features of the braincase or ten-syllable laminae on neural spines, and there just isn't much to get into. B. pronuspinax is refreshingly direct. Figure 1 from Gallina et al. (2019), showing A) a reconstruction of the material, B) the geography, and C) the bones as they were found in the field. CC-BY-4.0. You may be familiar with Amargasaurus cazaui, a dicraeosaurid that lived a few million years later in Argentina. If not, here's a mount that visited the Science Museum of Minnesota as part of a traveling exhibition a few years back. The thing to notice here is the neck. Yes, the twists and turns of selective pressures in Early Cretaceous South America had something grand in store for one particular lineage of smallish sauropods, at the probable cost of an instinctual dread of trees with overhanging branches. The discovery of Bajadasaurus shows that not only were extremely long spines on cervical vertebrae more than a one-off in dicraeosaurid evolution, the sauropods found multiple ways of growing them. Below is Figure 2 of Gallina et al. (2019), illustrating the various bones of the holotype. 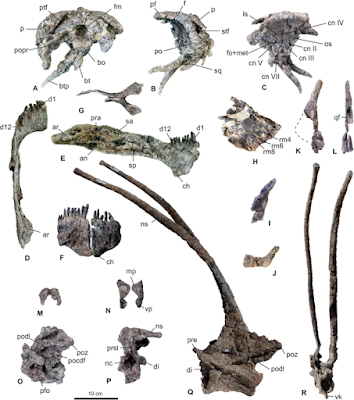 The one we're most interested in at the moment is the vertebra shown as parts Q and R.
Figure 2 of Gallina et al. (2019; see for complete caption). CC-BY-4.0. B. pronuspinax also has the "split neural spine growing into paired elongate spines" feature, only in its case the spines are pointed forward instead of backward. This species must have had a very good reason for putting out a significant expenditure of bone for something that was even more anatomically inconvenient than the spines of Amargasaurus (if you have enormous bony spines coming out of your neck vertebrae and curving forward, you *definitely* want to make sure that there is nothing nearby to catch on them as you move around, plus they probably aren't doing any favors for the mobility of your neck). 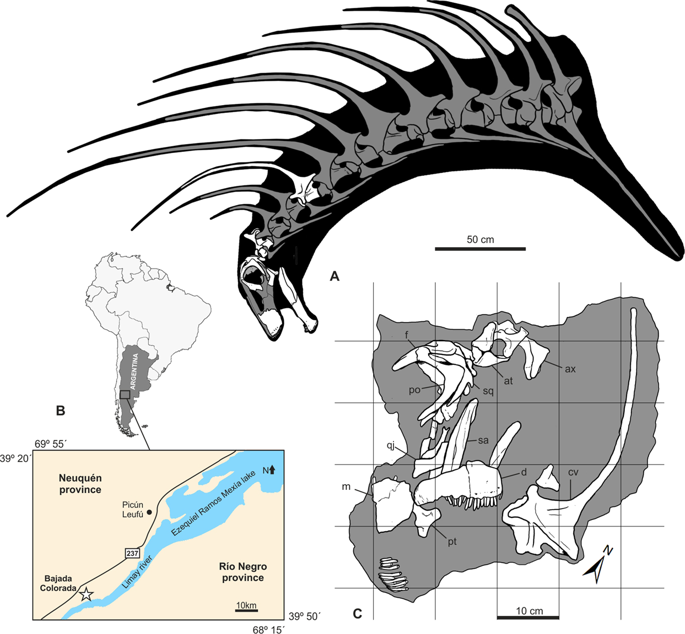 Amargasaurus and its backward spines have been a darling of speculation for years. You can find reconstructions with this animal sporting paired skin sails supported by the spines, a single thick ridge, bare spines, and various combinations (sails turning to spines, etc.). Most suggestions for what this feature did have centered on thermoregulation (big ol' radiating surfaces) and display. Gallina et al. (2019) instead proposed a defensive function, with the spines covered and extended by keratin. Keratin is advantageous because it resists impact strains better than bone, and breaking keratin beats breaking bone when vertebrae are involved. Under the authors' hypothesis, B. pronuspinax (and Amargasaurus) could become a hedge of spines when confronted with a large predator. Whether or not they are correct, just the presence of the long spines was probably an effective passive defense against biting attacks from the side or above, for the simple reason of how exactly is your average theropod with its long jaws supposed to make a solid strike on *that*? Also, there's a lot of a skull. B. pronuspinax is one of the rare cases where a sauropod skull is overshadowed by another feature of the skeleton (both figuratively and literally in this case). Here it is, if you'd like to contemplate the face of an animal with such unusual vertebrae. Figure 4 of Gallina et al. (2019). CC-BY-4.0. Broadly speaking, there are a few similarities with some of the titanosaurs we've covered recently, such as Bonitasaura. The teeth in both are slender pegs, and are crowded to the front of the jaws, and the halves of the lower jaws meet in a squarish U, more rounded in Bajadasaurus. Bajadasaurus comes from a lineage with a much more elongate skull, though, as opposed to the shorter, steeper skull of Bonitasaura. Gallina, P. A., S. Apesteguía, J. I. Canale, and A. Haluza. 2019. A new long-spined dinosaur from Patagonia sheds light on sauropod defense system. Scientific Reports 9: article 1392. doi:10.1038/s41598-018-37943-3. I wonder if there's any data on just how many sauropods were preserved with skulls. 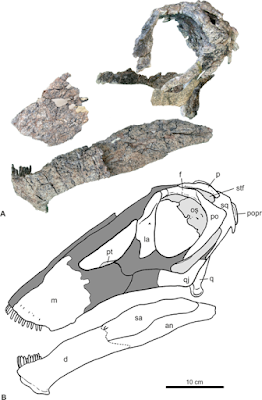 Looks like presence of skull in Bajadasaurus is quite a big deal. The titanosaur sample is still weak. There's Nemegtosaurus, Quaesitosaurus, Rapetosaurus, Sarmientosaurus, Tapuiasaurus, and then assorted braincases and jaw bones. Just to rub it in, only Rapetosaurus, Tapuiasaurus, and probably Nemegtosaurus are also represented by significant associated postcrania.